The pursuit for honours resumes following the international break as the Reds host fellow UEFA Champions League quarter-finalists Tottenham Hotspur. Manager Jürgen Klopp and captain Jordan Henderson acknowledge the work of anti-racism and discrimination association Kick It Out in their programme notes as this fixture marks the 25th anniversary of organisation. Elsewhere we have interviews with James Milner and Alisson Becker, John Wark features in The Big Read, while there's the story behind the matchday programme's cover design, put together by a young fan. 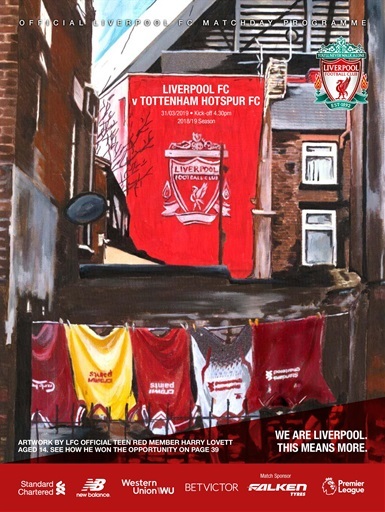 There's much more besides in the official matchday programme, on sale now.